By Arden Moore, a certified dog and cat behaviorist with the International Association of Animal Behavior Consultants. Arden is an author, radio host, and writer for Pets Best, a cat insurance and dog insurance agency. Yes, you can teach your kitten two basic cues 1) to sit and 2) sit up. In this article, we’ll focus on learning “sit up.” Your kitten will need to already know how to “sit” to then learn “sit up.” Learn how to train your cat to sit in this article. 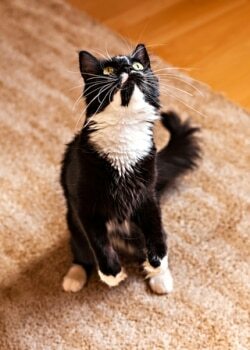 Training your kitty reaps benefits for both of you. You will have a well-mannered cat and your kitten gets the opportunity to stimulate its mind, hone its athleticism and sharpen its socialization skills. 1. Time the training when your kitten is calm and happy. With your kitten sitting on a sturdy chair or on the floor, hold a treat an inch or so over his head and say, “Sit up.” If he tries to swat at the treat with his paw or stands up on his hind legs and grabs your hand, don’t surrender the treat to him. 2. Look for the weight shift. Repeat the cue, “sit up” while holding the treat over his head. When he sits up and balances his weight over his hind feet, reward him with the treat and praise him. 3. Practice makes purr-fect. Repeat the cue-behavior-reward sequence several times in a 5-minute training session to reinforce the behavior. In all training, it is important to conduct the mini-sessions when your cat is hungry and to always use tiny, but nutritious treats that your cat can quickly bite and swallow and be ready to perform for the next treat. And, be aware that felines let you know when the session is over by walking away or suddenly have the urge to groom. Good luck!